The Queensboro Bridge, also known as the 59th Street Bridge – because its Manhattan end is located between 59th and 60th Streets – and officially titled the Ed Koch Queensboro Bridge, is a cantilever bridge over the East River in New York City that was completed in 1909. It connects the neighborhood of Long Island City in the borough of Queens with Manhattan, passing over Roosevelt Island. It carries New York State Route 25 and is the westernmost of the four East River spans that carry a route number: NY 25 terminates at the west (Manhattan) side of the bridge, which once carried NY 24 and NY 25A as well. The bridge is flanked on its northern side by the freestanding Roosevelt Island Tramway. The bridge was, for a long time, simply called the Queensboro Bridge, but in March 2011, the bridge was officially renamed in honor of former New York City mayor Ed Koch. No tolls are charged for motor vehicles to use the bridge. The Queensboro Bridge is the first entry point into Manhattan in the course of the New York City Marathon and the last exit point out of Manhattan in the Five Boro Bike Tour. Until it was surpassed by the Quebec Bridge in 1917, the span between Manhattan and Roosevelt Island was the longest cantilever span in North America. The upper level of the bridge has four lanes of automobile traffic and provides a view of the bridge's cantilever truss structure and the New York skyline. The lower level has five vehicular lanes, the inner four for automobile traffic and the southern outer lane for automobile traffic as well, used exclusively for Queens-bound traffic. The North Outer Roadway was converted into a permanent pedestrian walk and bicycle path in September 2000. The Manhattan approach to the bridge is supported on a series of Guastavino tile vaults which now form the elegant ceiling of the Food Emporium Bridge Market and the restaurant Guastavino's, located under the bridge. Originally, this open air promenade was known as Bridgemarket and was part of Hornbostel's attempt to make the bridge more hospitable in the city. Serious proposals for a bridge linking Manhattan to Long Island City were first made as early as 1838 and attempts to finance such a bridge were made by a private company beginning in 1867. Its efforts never came to fruition and the company went bankrupt in the 1890s. Successful plans finally came about in 1903 under the city's new Department of Bridges, led by Gustav Lindenthal (who was appointed to the new position of Commissioner of Bridges in 1902), in collaboration with Leffert L. Buck and Henry Hornbostel, designers of the Williamsburg Bridge. Construction soon began, but it would take until 1909 for the bridge to be completed due to delays from the collapse of an incomplete span during a windstorm and from labor unrest (including an attempt to dynamite one span). The bridge opened to the public on March 30, 1909, having cost about $18 million and 50 lives. A ceremonial grand opening was held on June 12, 1909. It was then known as the Blackwell's Island Bridge, from an earlier name for Roosevelt Island. In 1930, an elevator was built on the bridge to transport cars and passengers to what was then called Welfare Island, now Roosevelt Island. Then, in 1955, the Welfare Island Bridge from Queens opened, allowing automobile and truck access to the island and the only non-aquatic means in and out of the island; the vehicular elevator to Queensboro Bridge then closed, but wasn't demolished until 1970. However, as late as August 1973, a separate passenger elevator ran during the work week from near the Queens end of the bridge to Welfare Island via the Welfare Island Elevator Storehouse, which was described at the time as "clean but gloomy". The bridge's upper level originally contained two pedestrian walks and two elevated railway tracks (which connected a spur of the IRT Second Avenue Elevated Line to the Queensboro Plaza elevated station) and the lower deck four motor traffic lanes, and what is now the "outer roadway" and pedestrian walk were two trolley lanes. A trolley connected passengers from Queens and Manhattan to a stop in the middle of the bridge, where passengers could take an elevator or the stairs down to Roosevelt Island. The trolley operated from the bridge's opening until April 7, 1957. The railway was removed in the late 1930s and early 1940s as well as the 2nd Avenue Elevated Line. The trolley lanes and mid-bridge station, as well as the stairs, were removed in the 1950s, and for the next few decades the bridge carried 11 lanes of automobile traffic. After years of decay and corrosion, an extensive renovation of the bridge began in 1987 and completed in 2012, having cost over $300 million. In March 2009, the New York City Bridge Centennial Commission sponsored events marking the centennial of the bridge's opening. The bridge was also designated as a National Historic Civil Engineering Landmark by the American Society of Civil Engineers during the year of its centennial anniversary. In December 2010, the city announced that the bridge would be renamed in honor of former Mayor Ed Koch from the Queensboro Bridge to the Ed Koch Queensboro Bridge. The renaming decision was unpopular among Queens residents and business leaders, and many locals continue to refer to the bridge by its older name. New York City Council member Peter Vallone, Jr. from Queens vowed to remove Koch's name from the bridge. “Never in a million years would they think to rename the Brooklyn or Manhattan bridges,” said Vallone. “But for some reason, it was OK to slap Queens around." One Manhattan line operated over the bridge, the Third Avenue Railway's 42nd Street Crosstown Line from 1910 to 1950. The bridge carries the Q32 local bus route operated by MTA New York City Transit and the Q60 and Q101 local bus routes operated by the MTA Bus Company. The bridge also carries 20 express bus routes in the eastbound direction only. (These bus routes use the Queens-Midtown Tunnel for westbound travel.) They are the MTA Bus Company's QM1, QM2, QM3, QM4, QM5, QM6, QM7, QM8, QM10, QM12, QM15, QM16, QM17, QM18, QM20, QM21, and QM24, and New York City Transit's X63, X64 and X68. In F. Scott Fitzgerald's novel The Great Gatsby, Jay Gatsby and Nick Carraway traverse the bridge on their way from Long Island to Manhattan. "The city seen from the Queensboro Bridge," Nick says, "is always the city seen for the first time, in its first wild promise of all the mystery and the beauty in the world". In E.B. White's novel Charlotte's Web, Charlotte tells Wilbur that the bridge took eight years to build, while she could have built a web in a night. In the climax of Truman Capote's novel Summer Crossing, the main character commits suicide and murders three passengers by crashing her car into the Queensboro Bridge. The title of the Simon & Garfunkel song "The 59th Street Bridge Song (Feelin' Groovy)" refers to the Queensboro Bridge. Harpers Bizarre covered the song in 1967, with the record rising to No. 13 on the US Billboard Hot 100 chart, making it the musical group's best-selling hit. It is also cited in the Jack's Mannequin song, "Diane, the Skyscraper," on the Dear Jack EP. It is also mentioned by rapper and Queensbridge native MC Shan in his song "The Bridge". It is the title of a track from the album Indiana by singer-songwriter David Mead. In the 1932 Paramount Pictures light comedy film titled No Man of Her Own, starring Clark Gable and Carole Lombard, Lombard's character looks out of her hotel window to a view across the East River and the Queensboro Bridge, and refers to "Blackwell's Island", now known as Roosevelt Island. In Woody Allen's 1979 film Manhattan, the character played by Allen and Diane Keaton relax on a bench in front of it at dawn; it became the film's poster image . The climax of the 1985 film Turk 182! takes place on and around the Queensboro Bridge. Billy Joel's video for his 1985 single "You're Only Human (Second Wind)" was primarily filmed on the bridge. In the 1997 American action thriller film Conspiracy Theory, directed by Richard Donner, the bridge is crossed many times throughout the film. In the 2003 slapstick comedy film Anger Management, Dave Buznik (Adam Sandler) and Dr. Buddy Rydell (played by Jack Nicholson), stop their car in the middle of the bridge to sing "I Feel Pretty". 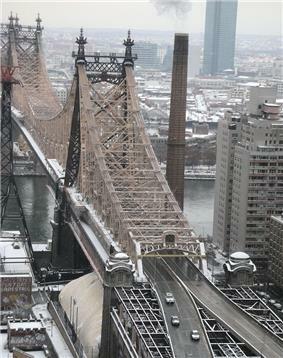 The 2010 movie Salt has a scene that takes place on, and was filmed on, the Queensboro Bridge. The Queensboro Bridge was featured as one of the few remaining bridges in The Dark Knight Rises after Bane took control of the city. The Queensboro Bridge has been shown in the credits of the television series Archie Bunker's Place, The King of Queens, Taxi, Rescue Me and Alphas. It is referred to in the opening theme of The King of Queens, in the line "...sitting here in traffic, on the Queensboro Bridge tonight." The bridge is also referred to in The Simpsons episode "You Only Move Twice", when Hank Scorpio destroys it to show that he's not bluffing. An illustration of the bridge by Aurore Giscard d'Estaing is used in the main title of the A&E TV series A Nero Wolfe Mystery (2001–2002). The bridge was destroyed in the video game Crysis 2 when a facility on Roosevelt Island exploded, causing the bridge to violently collapse. The bridge appears in the game Driver: Parallel Lines and is able to be traveled on foot or by car. During the mission "Kidnap" the player must blow up a billboard on the Manhattan side to block traffic. The bridge is part of the Nintendo DS game C.O.P. : The Recruit. ^ "New York City Bridge Traffic Volumes 2008" (PDF). New York City Department of Transportation. March 2010. p. 63. Retrieved 2010-07-10. 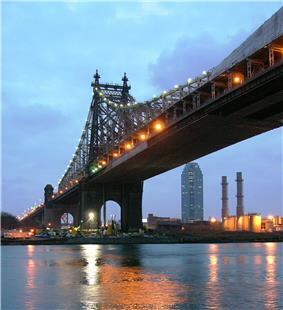 ^ "Project Page:2000 Biennial Bridge Inspection of the Queensboro Bridge over the East River". HAKS Corporation. Retrieved 2008-06-15. ^ a b "Queensboro Bridge". ASCE Metropolitan Section. Retrieved 2010-02-20. ^ "Queensboro Bridge Rehabilitation Program". New York City Department of Transportation. Retrieved 2010-03-13. ^ Dunlap, David W. (March 7, 1999). "Bridgemarket Emerging, After 22 Years". The New York Times. Retrieved 2010-02-20. ^ "Queensboro Bridge Opens to Traffic". The New York Times. March 31, 1909. p. 2. Retrieved 2010-02-20. ^ "300,000 See Queens Linked to Old City". The New York Times. June 13, 1909. p. 1. Retrieved 2010-02-20. ^ a b McCandlish, Phillips (April 7, 1957). "City's Last Trolley at End of Line; Buses Will Replace 49-Year Route on Queensboro Span". The New York Times. p. 1. Retrieved August 17, 2008. ^ a b "Transportation". Roosevelt Island Operating Corporation. Retrieved 2010-07-10. ^ Welch, Mary Scott (July 2, 1973). "Walking the City's Bridges". ^ Petroff, John (August 27, 1973). "Bridge Bits" (letter to the editor)". ^ "Roosevelt Island Tramway". New York Correction History Society. Retrieved 2010-02-20. ^ Phillips, McCandlish (April 7, 1957). "City's Last Trolley at End of Line; Buses Will Replace 49-Year Route on Queensboro Span". The New York Times. p. 1. Retrieved 2008-08-17. 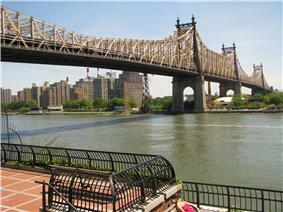 ^ "Queensboro Bridge Centennial Celebration Events and Exhibits". NYC Bridge Centennial Commission. Retrieved 2010-02-20. ^ Bultman, Matthew; Fanelli, James (December 9, 2010). "Just call 59th Street Bridge the Ed Koch". Daily News (New York). Retrieved 2010-12-09. ^ Lisberg, Adam (February 28, 2011). "Queensboro Bridge should not be renamed after former Mayor Ed Koch, 70% of Queens biz leaders say". Daily News (New York). Retrieved 2011-02-28. ^ Hernandez, Javier C. (March 23, 2011). "Council Votes to Rename Queensboro Bridge for Koch". New York Times (New York). Retrieved 2011-03-23. ^ Briquelet, Kate (July 14, 2013). "Queens councilman drafting legislation to take former mayor Ed Koch’s name off Queensboro Bridge". New York Post (New York). Retrieved 2013-07-16. Greater Astoria Historical Society and Roosevelt Island Historical Society (2008). The Queensboro Bridge. USA: Arcadia Publishing. Historic American Engineering Record (HAER) No. NY-19, "Queensboro Bridge"